A curious genetic phenomenon, found nowhere else in the world, is occurring in the Similipal Tiger Reserve (STR) in Odisha. Normal tigers are giving birth to black or melanistic tigers and even normal cubs are being delivered by the black or melanistic tigresses. A census carried out by the Odisha forest department in STR in 2016 found six- seven melanistic tigers out of a total of 29, including cubs that have so far been recorded through camera traps. “We are witnessing a growing trend of black tigers in STR in the past few years. In a litter comprising three-four cubs, one or two are born dark,” says Ajit Kumar Satpathy, deputy field director, STR. Former honorary wildlife warden of STR, Bhanumitra Acharya, says the black stripes running across their bodies are much broader and thicker than those seen in normal tigers, so much so that their tawny skin colour is barely visible. “What is even more unusual is that neither are their activities and behavioural traits different from the usual tigers nor do they face problems of acceptance within the tiger community,” adds Acharya. Black tigers can also be found at the Nandankanan Zoo, Bhubaneswar, where they are caged and are healthy. Since the 1970s, there have been sporadic sightings of black tigers in STR. Records reveal that two adult melanistic tigers were spotted by Bitanath Nayak, then assistant field director, STR, on a road near Matughar in south Similipal. In 1991, Niranjan Mohanta, a forest guard in the upper Barakhamba Range of STR claimed to have sighted a family of black tigers. However, both these sightings were dismissed as a case of mistaken identity. “The subject acquired a scientific foothold only in July 1993, when a melanistic tigress was killed by a tribal youth in Podagada village, near Similipal,” says L A K Singh, former research officer at STR. But the real breakthrough came in 2007 when researchers from the Wildlife Institute of India, Dehradun, used camera traps and captured pictures of three melanistic tigers. About 170 pairs of camera traps were installed in STR in 2012-2013, which had been recording interesting findings, says Satpathy. A black tiger captured on camera in June 2012 got widespread media attention. In 2013, a male black cub, which was camera trapped in 2013, was found to have moved to the nearby Hadgarh Wildlife Sanctuary in Keonjhar district. In 2015, a normal tigress was found with a melanistic cub, while in 2016, a melanistic tigress was photographed with her three cubs, two of which were black, says Satpathy. Experts are attributing this rare phenomenon to many factors—climatic conditions, genetic mutation and inbreeding. 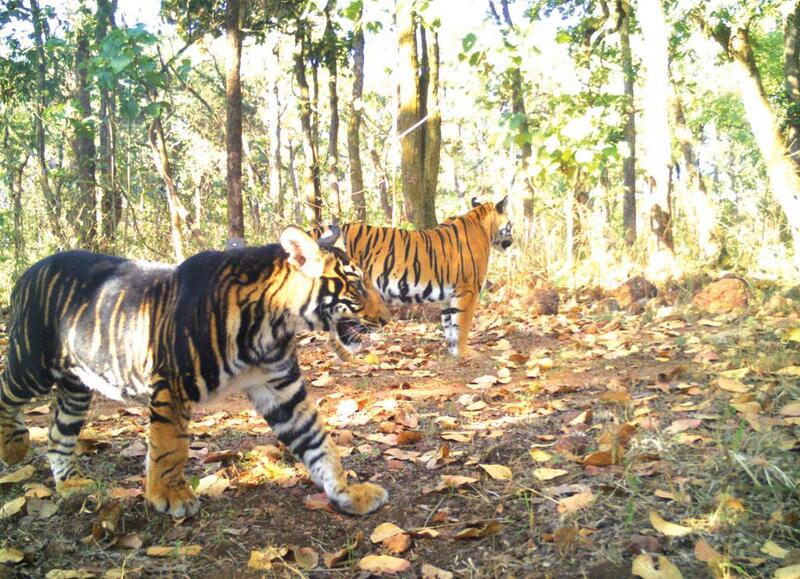 “A combination of high rainfall, rising temperatures and soaring humidity may have resulted in the melanistic mutation of Similipal tigers,” says Debabrata Swain, member secretary National Tiger Conservation Authority. “In fact, the striped pattern of the habitat is being replicated on the skin of the tigers,” says Swain, indicating that the change in appearance could be the result of the existing environment. The usual preying behaviour of the tiger is facilitated by the presence of open grasslands, helping the predator to first target its prey, then chase, and finally capture it. But there are not many open grasslands in Similipal; there are only dense forests—through which the tiger sneaks, hiding from its prey. It waits and watches, calculates the move of its victim, and then strikes suddenly. The principal prey base for tigers in STR is sambar, which thrives in moist, deciduous sal forests. The broad black stripes, thus, provide the advantage for the melanistic tigers to camouflage itself in these dense forest vegetation to catch its prey, he explains. Singh offers a genetic explanation: “Normally, the tiger’s coat displays a combination of three shades—white, yellow and black. The background colour of the body is controlled by a set of agouti genes and their alleles—pairs or series of genes on a chromosome that determine the hereditary characteristics.” Tabby genes and their alleles, on the other hand, control stripes. Built within the two series (background and stripe) there are certain genes that determine the location-to-location and quantum of expression of the three main skin colors. “The absence of any of these colours or suppression of the effects of such genes can lead to variations in the shades,” says Singh. “The phenomenon is probably the result of a mutation or genetic change,” says Uma Ramakrishnan, associate professor, National Centre for Biological Sciences, Tata Institute of Fundamental Research, Bengaluru. “Mutations mostly occur by chance. While some can be good, resulting in better fitness and more offspring, others can be detrimental,” she says. “Something must have happened in their gene combination, which is reflecting in the body coat,” says Acharya. He has initiated a study to find the cause. While colour aberration of tigers may be an attraction for visitors, it does not augur well in terms of their biological or conservation implications in the wild, says Singh. “More aberrations in nature mean all is not well with the natural gene pool, making it necessary to have increased tiger corridors to reduce genetic depression,” he says. Acharya says while the tiger population in STR is increasing, their dispersal between the northern and southern parts of the reserve is getting restricted. There are about 61 revenue villages occupying about 900-1,000 sq km out of the 2,750 sq km of the reserve. As a result, tigers have been confined to a smaller area. Smaller number of wild population means reduced gene pool, and due to the presence of lesser number of individuals, one cannot rule out inbreeding, he says. Notwithstanding the differences, experts agree that a thorough research needs to be done. In the case of the elusive White Bengal Tigers, it was found to be a mutation, but its genetic basis still remains unknown. Satpathy, however, adds that researchers need to find out whether this genetic change is occurring due to the dominant or recessive gene. If it is the recessive gene, there is an urgent need to bring about genetic diversity through translocation of tigers to ensure a long-term healthy tiger population in Similipal. Hopefully, ongoing research on black tigers will go into the heart of this rarity. "Future of local population rests on tiger-related tourism"